Weathering has caused the marker to come apart. 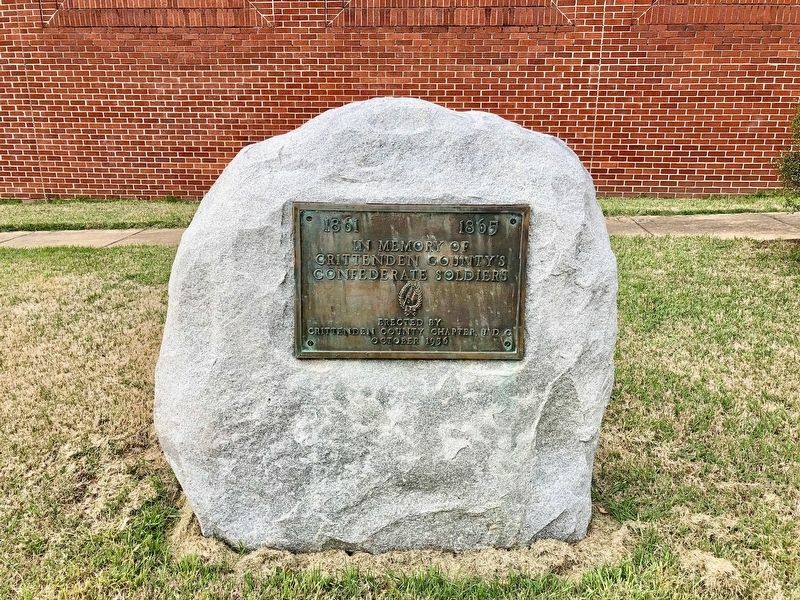 This granite marker on the south lawn was erected by Crittenden County United Daughters of the Confederacy, and dedicated October 4, 1936, as a memorial to those who served with Confederate military during the War Between the States. 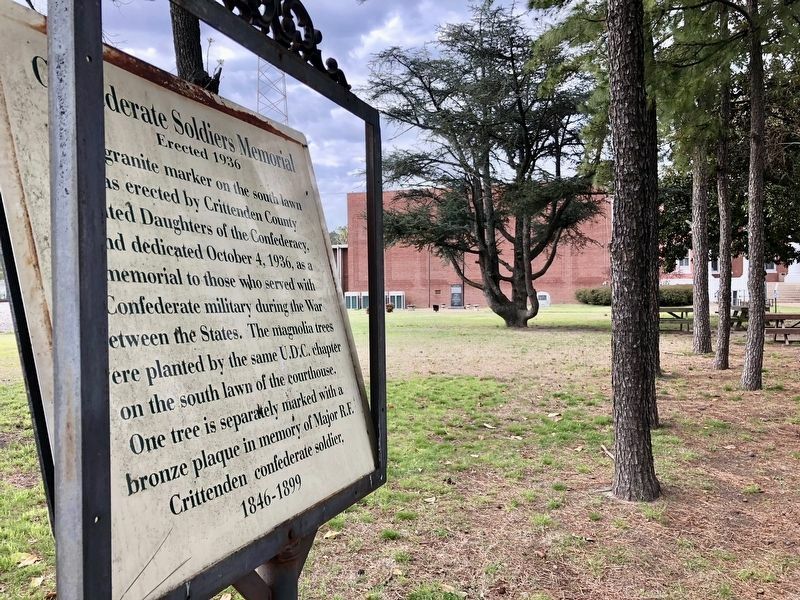 The magnolia trees were planted by the same U.D.C. chapter on the south lawn of the courthouse. One tree is separately marked with a bronze plaque in memory of Major R.F. Crittenden confederate soldier, 1846-1899. Erected by the City of Marion. Location. 35° 12.912′ N, 90° 11.819′ W. Marker is in Marion, Arkansas, in Crittenden County. Marker is on Court Street north of East Military Road, on the right when traveling south. Touch for map. Marker is at or near this postal address: 89 Court Street, Marion AR 72364, United States of America. Touch for directions. distance of this marker); Military Road (about 400 feet away, measured in a direct line); The Sultana Tragedy (about 400 feet away); The Loss of the Sultana (about 400 feet away); Crittenden Bank & Trust Company (about 500 feet away); Marion Hotel (about 500 feet away). Touch for a list and map of all markers in Marion. 3. View from marker towards Courthouse with the monument in far middle background. More. 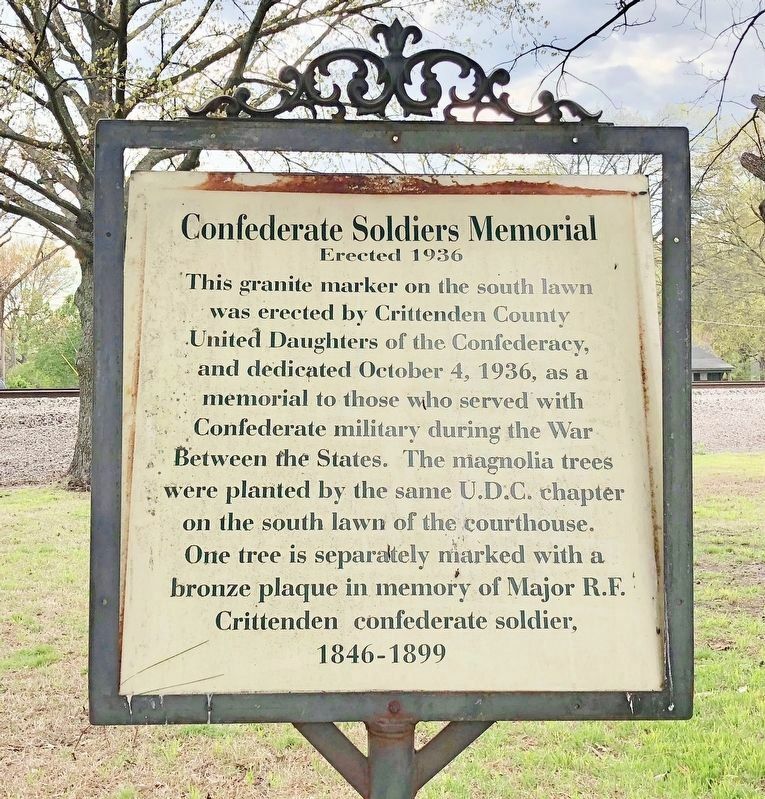 Search the internet for Confederate Soldier's Memorial. Credits. This page was last revised on April 24, 2018. This page originally submitted on April 24, 2018, by Mark Hilton of Montgomery, Alabama. This page has been viewed 63 times since then and 6 times this year. Photos: 1, 2, 3. submitted on April 24, 2018, by Mark Hilton of Montgomery, Alabama.